Snapchat due to its privacy features of self-destructing media and text gained popularity among teenagers. 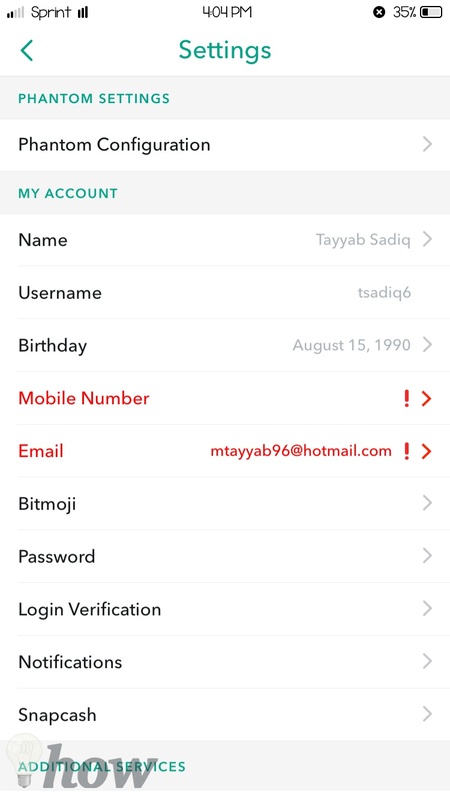 For all those who don’t know, you cannot save incoming media or text in the Snapchat and whenever you will try to take a screenshot, the sender will be notified by Snapchat. There are plenty of ways to take screenshots without the other person knowing, however, saving Snapchat video has always been a big problem. 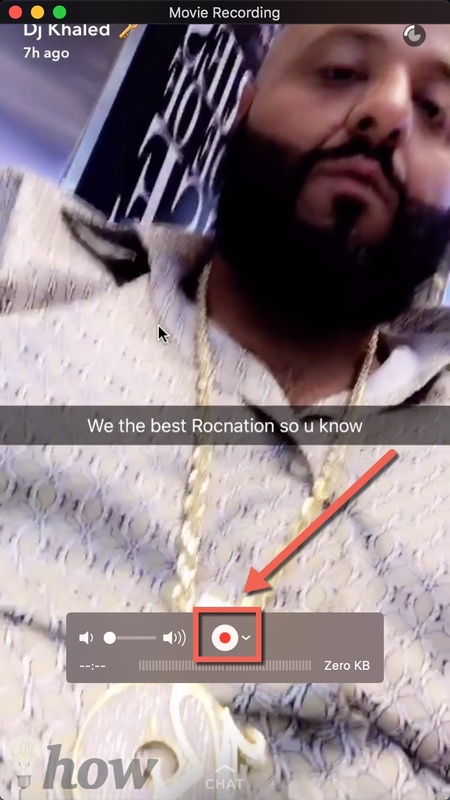 Natively, there is no way to save Snapchat videos of other users on iPhone or Android device. 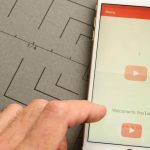 However, there is a way to solve this problem, you can either record the screen of your device to save the videos or can use the third-party applications to save the Snapchat videos. The second method has certain advantages over the first one as it will add other useful features to the Snapchat application. If you don’t have the Jailbroken application and just want to save the videos, we will highly recommend you to use the first method. This method is very simple and is dependent on the screen recording application which will not download the Snapchat videos but will record them like a screen capturing tool. 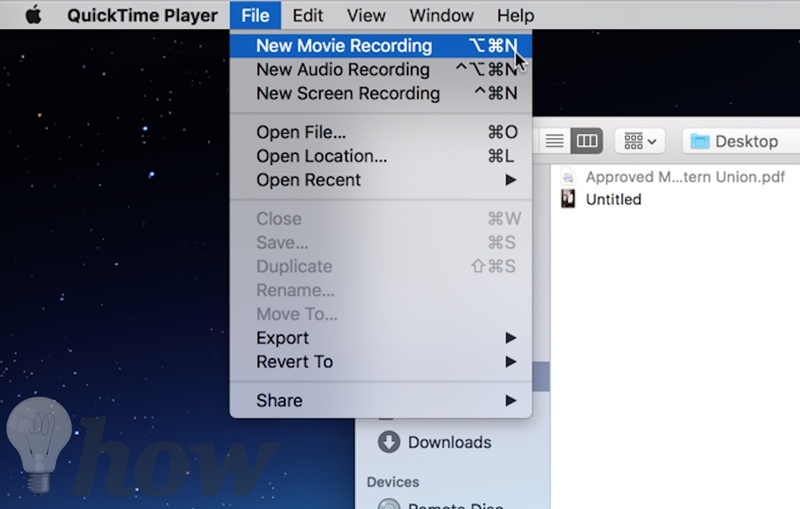 In order to record the screen of your iPhone, you will need to have Mac as the QuickTime Player of your Mac will be used to record the screen or the Snapchat video. Here’s how this method will work. First of all, download the latest version of QuickTime player on your macOS. Click Here to download the QuickTime Player and follow on-screen instructions to install the program. Now, connect your iPhone with the PC using USB Cable and Launch QuickTime Player on your Mac. It will open the FaceTime Camera on your Mac. Click on the little arrow next to the record button as shown in the screenshot below and select your iPhone. Wait for a few seconds and you will see the screen of your iPhone on your Mac. On your iPhone, launch Snapchat and open the video that you want to record. As soon as you open the video, hit the “Record” button on your Mac. Once you are done with the recording, hit the “Stop” button. 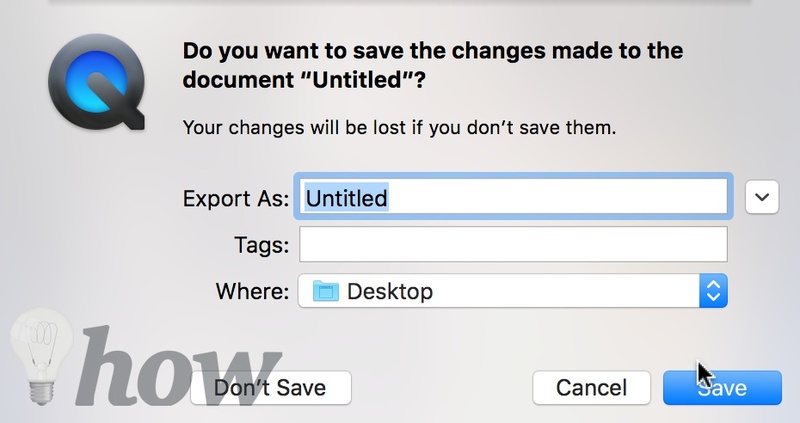 Now, hit the cross button on the same screen and it will ask you to “Save” the video on a folder on your Mac. Hit the “Save” button and you are good to go. By this way, you can save any video that you want from Snapchat or any other application from your iPhone. 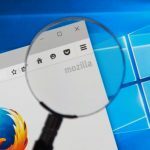 Android Phone users will not have to connect the device with the computer and all of it can be done using a simple application from the Google Play Store. 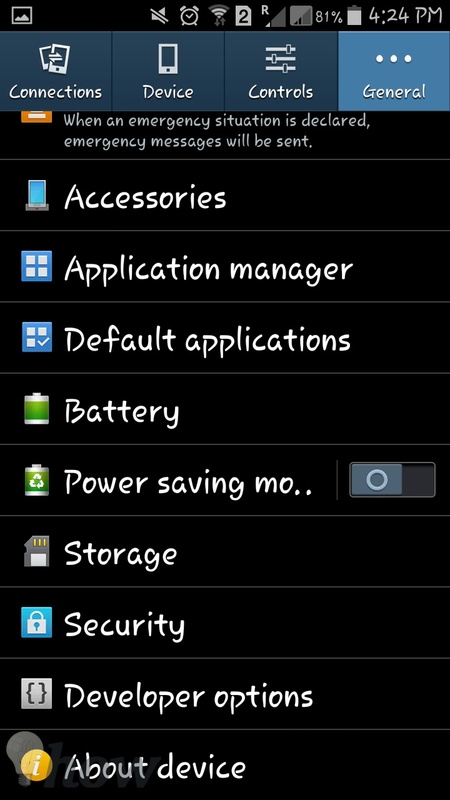 This app is called “AZ screen record No – Root [Play Store Link] and will work on all the latest Android devices. However, if your device is not compatible with this application, you can use the second method which is actually an extension of the Snapchat. 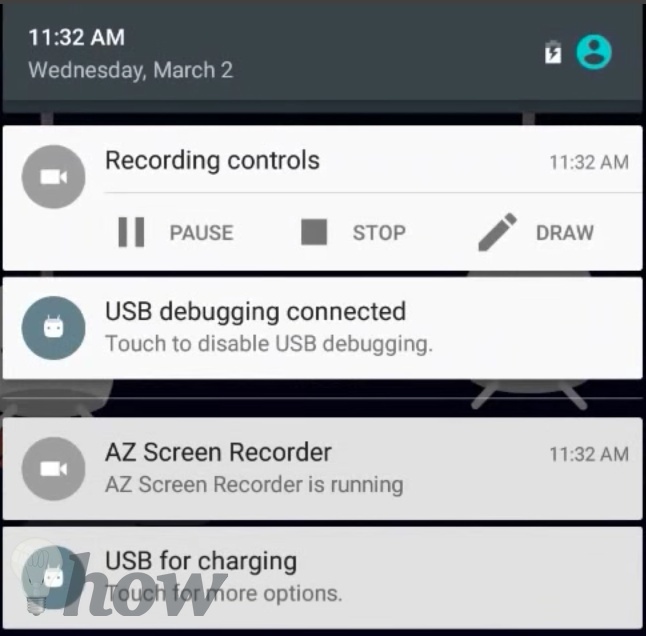 Here’s how AZ Screen Record will work on your Android Phone. Download the application on your Android Phone and launch it. 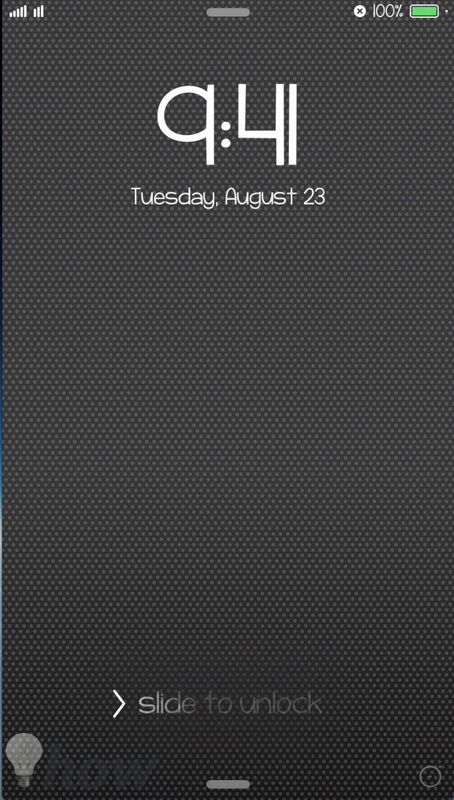 As the application launches on your phone, it will add a small widget on your screen as shown in the screenshot below. Now, open the “Snapchat” on your Android Phone and hit the “Recording” button. Alternatively, you can minimize the AZ Screen recorder and use the notification center, you can initialize or stop the record. 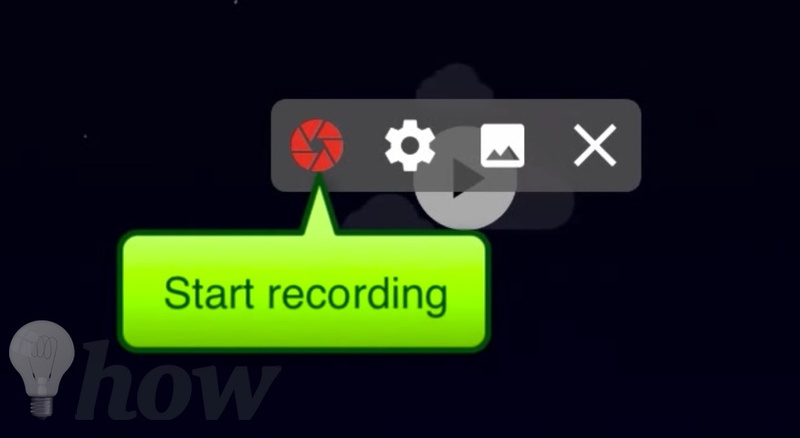 Once the recording is finished, swipe down from the screen and hit the “Stop” button. After recording, you can edit the videos or can share with other friends. 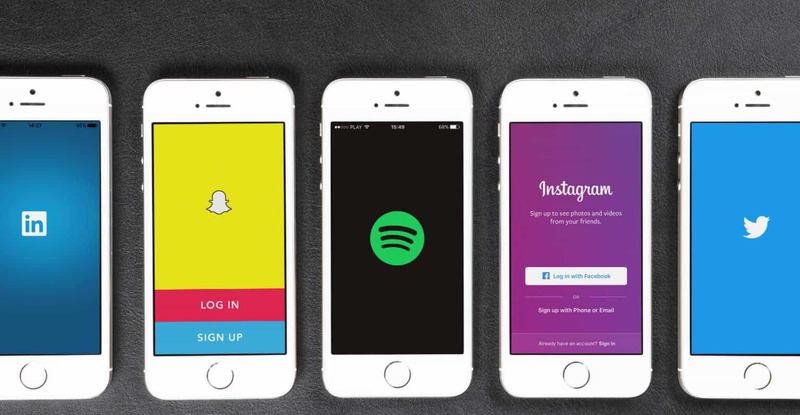 This method will give plenty of new features to Snapchat on your iPhone. So, you can use Snapchat without any limitation. 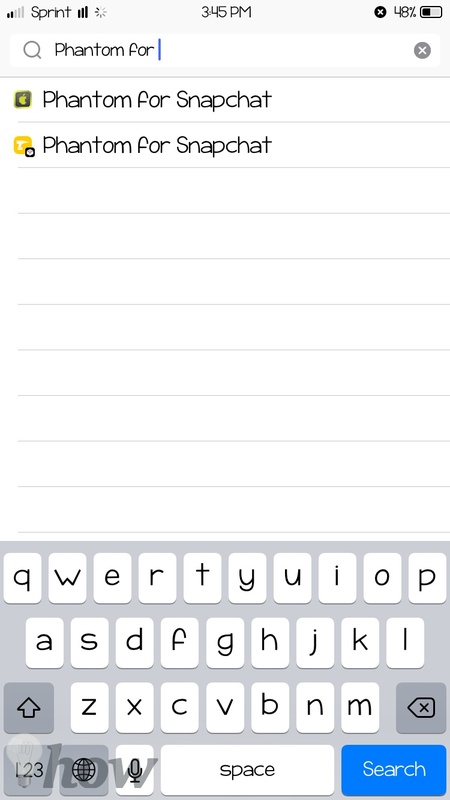 All you will have to do is download “Phantom for Snapchat” from Cydia Store on a jailbroken iPhone. 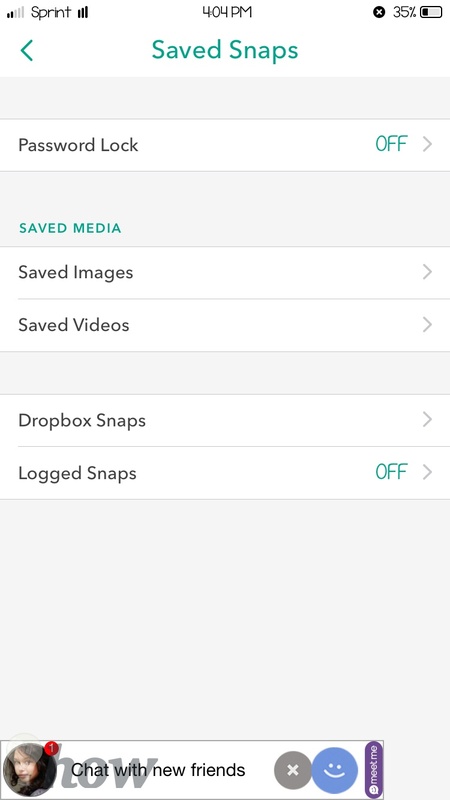 Phantom will let you save any snap on your iPhone, directly to Dropbox and you can even lock the snaps on your iPhone with a strong password. Here’s how you can install and use Phantom on iPhone to save Snapchat videos. 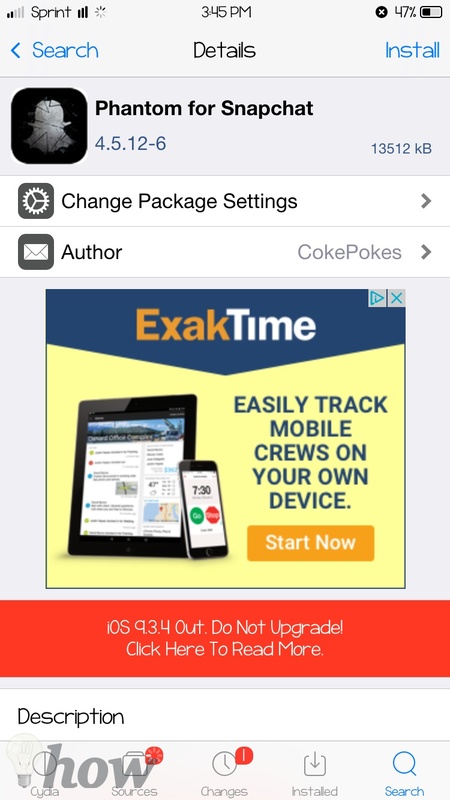 This application comes free with the Ads, however, you can use the In-App purchases to buy the Ad-Free version of Phantom. Click on “Install” button to download this application on your iPhone. After installation of “Phantom”, Launch Snapchat and swipe from top bar to bottom. Click on the “Settings” icon and you will see a new configuration bar on the bar. Click on “Phantom Configuration” to open the settings for Phantom. Now, click on “Saved Media” to change the settings for incoming media. Finally, click on “Saved Videos” to see the already saved videos from Snapchat. You can also lock the videos by a strong password. 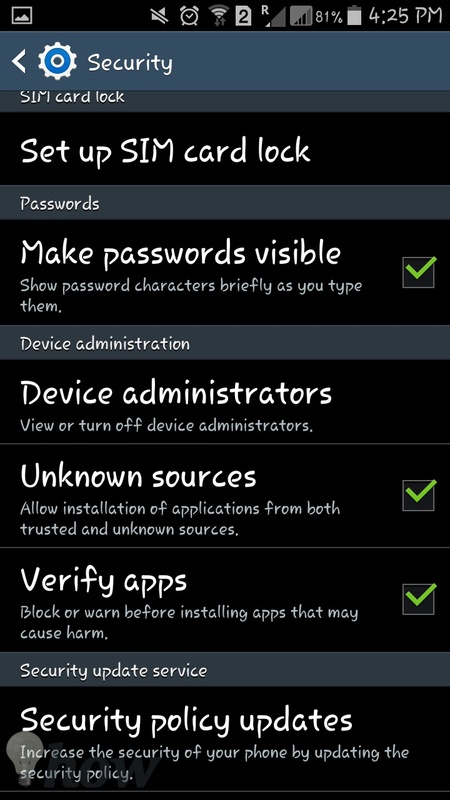 Unlike iPhone users, Android users can download and manually install a third-party application on their device. “Casper” is the application which can be used to save the videos on Android Phone. This application is not available in the Google Play due to privacy issues. 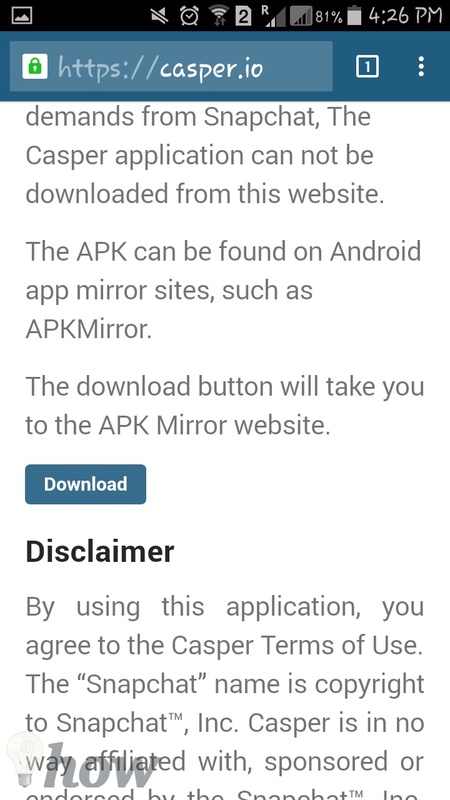 However, it can be downloaded from the developer’s website to the Android Phone. Before installing the Casper application, you will have to enable the “Unknown Sources” from the settings of your phone. Go to “Settings” and scroll down till you find the “Security”. Scroll down and enable the “Unknown Sources” as shown in the screenshot below. Now, you are all set to install the application on your Android Phone. Go to www.casper.io from your Android Phone. Scroll down till you see the “Download” button. 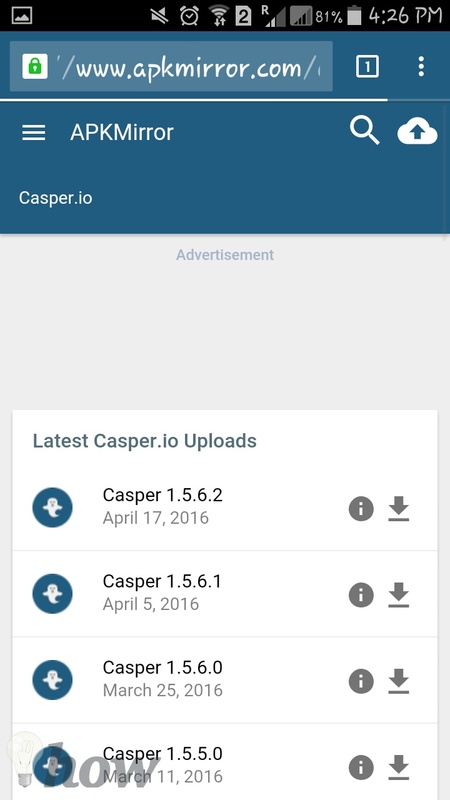 Hit the Download button to install Casper on your Android Phone. After installation, you will be able to save Snapchat videos directly on your Android Phone. If you’re an iPhone user, we will highly recommend you to use the first method to save the Snapchat videos. However, the Android users should try to use the Casper to save the videos as it will add plenty of new features to Snapchat on Android.